This remarkable book explores the simple internal calculator processes—algorithms and programs—that tell us, for example, that the cosine of 56? is 0.5591929035. 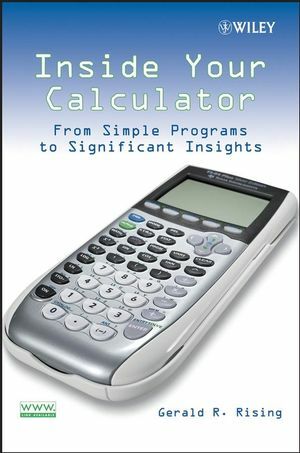 Using carefully constructed diagrams and figures, the author effectively demonstrates how calculator keys compute powers, roots, logarithms, and trigonometry functions, while also providing insights into simple programming, the conversion between decimal and binary numeration, and perhaps most importantly, the structure of our numeration systems. Many people believe that the processes that drive calculators demand advanced mathematical concepts; however, this book proves that a minimal understanding of algebra and geometry is all that is needed to follow the step-by-step explanations of how scientific calculators work. While the simultaneous use of a calculator is not needed to gain insight into how the algorithms work, those who do have a programmable graphics calculator can experiment with the programs presented in the book. These programs may be used on TI-84 and TI-83 calculators, and additional information for other Texas Instruments calculators as well as the Casio FX series is available on the book's related web site. As a result of over fifty years of award-winning teaching experience in both high school and college classrooms, Dr. Rising anticipates and answers potential questions from readers, and he successfully brings this subject alive in an illuminating and entertaining way. This book is therefore not only ideal for undergraduate mathematics majors as either a primary or supplemental text, but it also appeals to anyone with an interest in mathematics and its ideas. Gerald R. Rising, PhD, is State University of New York Distinguished Teaching Professor Emeritus at the University at Buffalo. He is also the Founder and Co-Director of the University at Buffalo Gifted Math Program. Dr. Rising has authored six professional books, thirteen mathematics texts, and more than 100 articles on mathematics and teaching mathematics. Written by an expert in mathematical education, this well-organized book reflects the author's forty-plus years of teaching and writing experience. This book constitutes a complete and multi-faceted exercise in critical thinking. The author focuses on explanations that are based on only high school basic algebra and geometry (both of which are reviewed in context) in an effort to appeal to a broad range of readers who are attracted to mathematics and its ideas. Well-conceived, illuminating, and entertaining diagrams and other figures are found throughout the book. Teachers, at both the high school and college level, will especially enjoy this book since it provides insight to answer student questions such as "Why is this important?" The history of mathematics is discussed when appropriate and provides a foundation for further learning.